Wu is from Zhejiang province and was born in 1963. 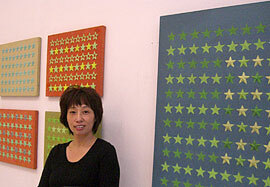 She is a professional artist and is currently residing in Song Zhuang, the art district of Beijing. Wu’s paintings are full of imagination. She often comes up with stunning ideas and fantasy that cannot be grasped by logical thinking. “To be a professional artist in China is not easy and it is more difficult for female artist to survive in a man’s world. Wu’s paintings are special, in a way that people could feel the femininity and get connected,” said local art critics. “I love painting because I want to express my true feelings, my dreams, all kinds of things happening around me and make the impossible possible in my art. When one day, I do not feel or dream anymore, I think it will be the time for me to stop painting,” said Wu. In the past decade, Wu’s paintings were exhibited in major galleries and exhibitions in Beijing, Xi’an and Hong Kong. Selected artworks were exhibited abroad in France and Korea.